QUANTITY PRICING:Available with this product, see below for specifics! Custom logo: will be printed in the imprint color selected Logos may be sized to fit area. The 4929C - 2 part Restaurant Guest Check, Bi-Lingual with guest receipt highlights Spanish in your restaurant. 4929C - 2 part Restaurant Guest Checks, Bi-Lingual with guest receipt is an attractive guest check with 14 lines on an attractive form with a tear away guest receipt for your customer's tax or other record keeping needs. This bilingual Spanish 2 part restaurant guest check is printed on a stiff 32 pound bond paper for part two and a lighter weight paper for the top copy, or part 1. The 4929C Pegasus Ventures brand guest checks are custom imprinted to meet your restaurant's needs. The 4929C imprinted restaurant guest checks are available without customization, as well. Click or swipe here for more information! Pegasus Ventures brand restaurant guest checks come with volume pricing. The more you order, the lower your per case cost for your guest checks. The 1 Part Bilingual Spanish Restaurant Guest Checks Custom Imprint for Restaurants come with substantial savings as you increase the number of cases ordered. Sometimes a sticky issue, getting the artwork right for printers generally requires high resolution vector artwork. So places to find what Pegasus Ventures Michigan needs for placing logos on restaurant guest checks can be taken from proofs used for menus, shirts, signage or other custom work. Logos designed by graphic artists take no more than a phone call asking the graphic artist to email the original file. Pegasus Ventures Michigan also offers a service converting low resolution logos for printing and other high resolution needs. The additional cost is just $70 for set up the high resolution version of the logo. If the logo sent does not meet specifications the set up fee would be charged separately. High resolution graphics make ordering many other products from any kind of printing to giant signs along the road. It benefits the business having a high resolution version of logos on hand. Choose a six-digit number for your imprinted form! Otherwise, we will start with 001001. 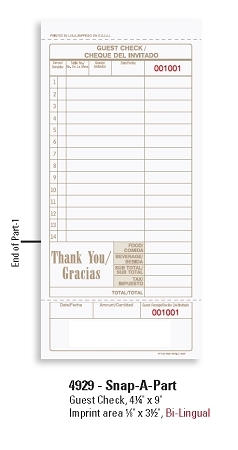 Restaurant Guest Checks Custom Imprinted for your restaurant can be padded into sets, hot-glued together with a hard backer for writing support and security, The cost for padding this guest check is $13 per case.